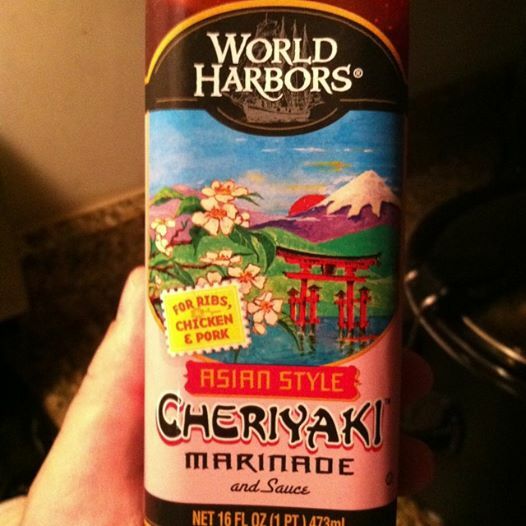 So the other day my wife came home with this bottle of something, some Cherry Yaki whadya-call-it, given to her by her friend Lisa, and I immediately wrote it off as gimmicky crap… Oh, my, God, I have never been sooooooo wrong! I finally tried this bottle of stuff that was sitting in my fridge, actually named Cheriyaki, and it was absolutely amazing. It tasted just like the glaze from Chinese spare ribs, which are a weakness of mine. When we have leftover Chinese in the fridge I’ve been known to wake up at 3am and sneak downstairs for a second helping of spare ribs… no lie. I knew that I needed to make something with this heavenly sauce as soon as possible, but I didn’t want to be so common as to make ribs or chicken with it. Why not go Americana and make it Asian-awesome!? Yeah baby, Cheriyaki pulled pork! So here’s my recipe for an Asian style pulled pork, and it was done in a crockpot which is a first for me. Never before on this site have you seen that cooking implement used! You can serve this on a sandwich or over rice… Go crazy. I personally served it on homemade Korean rolls called ppang, you can find the recipe here. 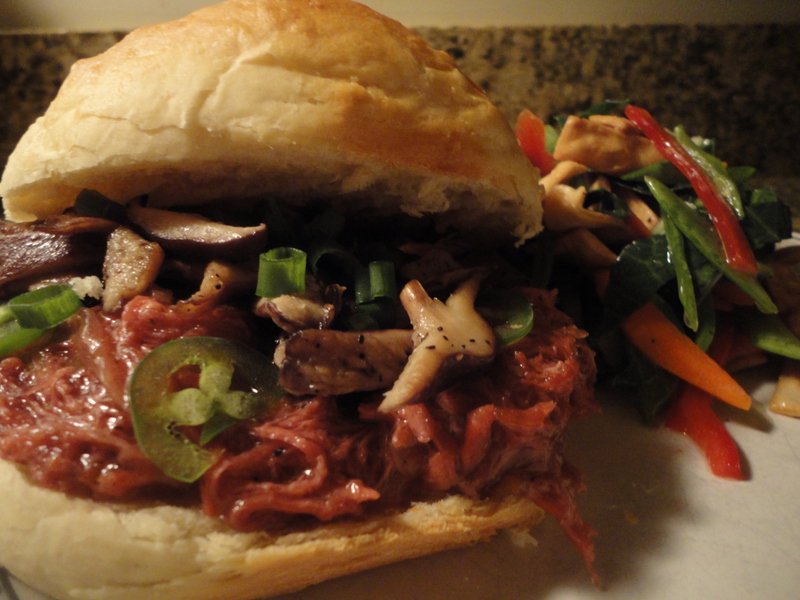 I also topped my sandwich with some shiitake mushrooms, jalapeno and scallion, which will be included in the recipe below. Oh, and World Harbors, I’m expecting some form of royalty (or at least free product) for this shout out!!! hahaha… No, seriously. Ok, so this is pretty damn easy… like amazingly so! Set your crockpot to the 6 hour setting (or low if yours doesn’t have time settings) and, with the exception of the Cheriyaki sauce, put all of the ingredients listed under “pork” in there. Let it cook for the full 6 hours. Remove the bay leaves, and ladle out 2 cups of the liquid (if you want you can save this and use it for stock at a later date). Using two forks shred the pork. Add the Cheriyaki sauce and stir well, turn your crockpot setting to High and cook for an additional 2 hours. That’s it, Asian pulled pork. How easy was that!? Now let’s say you don’t have, or choose not to use, a crockpot. Follow the same instructions but substitute crockpot for large pot on your stovetop, use low heat, stir periodically, and keep in mind your timeframe will be shortened dramatically. You’ll just have to be more on top of the cooking. I can say this… Personally, I PREFER to not use a crockpot. I like to have more control over my heat and cooking times. However, I will admit that the convenience of the crockpot, on this particular day when I couldn’t stay on top of the pot, was advantageous. Will you be seeing a plethora of crockpot recipes in the near future? Not likely. In a medium sauté pan melt your butter at medium-high heat. Add the sliced shiitake mushrooms, salt and pepper, cook until lightly browned. Set aside at room temperature. When the pork is done simply top it with the mushrooms, raw sliced jalapeno and fresh chopped scallion. Delicious! As far as sides go, I tried going with something light and crisp to offset the decadence of the sandwich, so I decided to go with a very nice Asian Salad. Tags: asian, cheriyaki, chinese spare ribs, perfect pairings, perfect pairings at home, pork, pork sandwich, pulled pork. Bookmark the permalink.